Pelican Cruise Halong Bay offers a 4-stars cruise experience in Halong Bay, the 3 Pelican Cruises will take you for an unforgettable discovery, offering the best program for visiting and enjoying the bay’s natural wonders. Features: New Luxury Cruise! Pelican Cruise has just been launched in the early 2012. Bonus: Balcony Royal Suite! Pelican Cruise offers 02 Royal Suites with balcony! With three similar boats providing 22 double cabins each, ranging from 16m2 to wider suites, Pelican Cruises’ outstanding settings will be yours for the whole length of your stay on board, and the friendly and well trained crew will answer each of your requests to make your stay on board a warm experience. 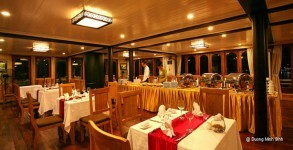 Pelican Cruise’s restaurant is opened to serve you from breakfast to lunch and dinner, in a mix of Western and Vietnamese fine cooking, while the wide upper sundeck allows you to contemplate sunset while sipping an aperitif. 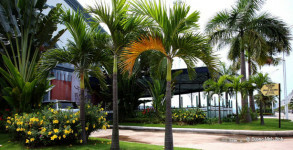 State-of-the art security conditions are the guaranty for an unforgettable journey. Pelican Cruise’s highest security standards will be provided through state-of-the-art equipments and a continuous coaching of the crew. The Pelican Cruise will operate the latest electronic devices to operate safe cruises in all sea and weather conditions: sonars and radars, engines’ control and fire detection will prevent any sort of possible damage on the boats. All cabins on Pelican Cruise are equipped with alarm devices linked to a central monitoring system, smoke sensors and fire extinguishers, hydrants and hoses, life jackets and clear emergency instructions. Local and international crew will be trained to implement clear safety processes, while a speed boats’ fleet will be ready 24/24 to operate emergency rescue. 8:00 Hotel or private address pick-up with our shuttle bus, then start the scenic, 3.5 hour drive to Halong Bay. Enjoy the landscape of the Red River Delta country side and have a short break on the way. 12:30 Check-in at Tuan Chau Marina, Tuan Chau Island. Embark on our Luxury Cruise for a Welcome drink followed by a cruise briefing. 13:15 Lunch is served while cruising towards Da Chong islet, passing by areas of Vung Dai, Ba Cua, Cay Tao, Con Vit islet, going along Gia Luan. Pass over Soi Sim beach. 15:30 Back to visit Sung Sot (Surprise) cave, then do swimming by Titov or Soi Sim beach. 18:00 Cruise to Ho Dong Tien or Trong Cave for anchorage. 21:00 Squid fishing program with the staff or relax and chatting with your friends and family. 07:00 Have breakfast while cruising towards Luon Cave, passing by Dau Nguoi islet (Men head islet), Con Rua islet (Tortoise islet). 07:45 Transfer to a local rowing boat to visit Luon Cave. 08:30 Back to the boat, relax before checking out round 09:30 while passing by Hoa Cuong area, Ngon Tay islet (Finger Islet), Ga Choi islet, Lu Huong islet, Ba Hang area, Dog islet. 10:45 Lunch is served in the restaurant. 11:30 Disembark at the harbor. Take our shuttle bus to return to Hanoi. 15.10 – 16.30 Visit Bat cave by bamboo boat or kayaking based on your preference. Enjoy quiet space and pure air, you will feel relaxed truly. If lucky, you will have chance to see monkeys on islands.